Did you grow up in Salmon Cove? Do you remember bucking barrels for bonfire night? Do you recall sliding in the winter or playing on the beach in the summer? 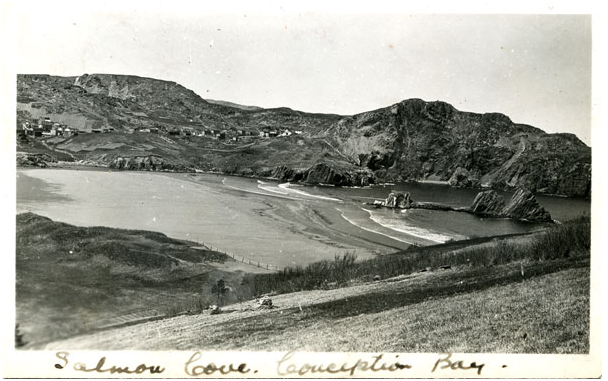 Do you have old photos of Salmon Cove? The Heritage Foundation NL, in partnership with community members in Salmon Cove, wants to know! We’ll be hosting a Salmon Cove Oral History Event at the Salmon Cove Community Centre (SCPC Fire Department) on Main Road on Wednesday, October 11th, 2017 at 10am. The Salmon Cove Memories Oral History Event is part of the Foundation’s Oral History Roadshow. This project is an initiative of the Intangible Cultural Heritage Office of the HFNL made possible with assistance from the New Horizons for Seniors program. The Oral History Night Roadshow will see researchers travel from community to community, hosting a series of Oral History Nights, open-mic storytelling sessions led and inspired by seniors in that community. Come for a cup of tea, a bite to eat, and share a memory or two about growing up in Salmon Cove. If you have old photos, bring them along!